Bangladesh began their Asia Cup 2018 campaign with an emphatic 137-run win against Sri Lanka on Saturday. Bangladesh began their Asia Cup 2018 campaign with an emphatic 137-run win against Sri Lanka on Saturday. Chasing 262, Sri Lanka, the five-time winners at Asia Cup, were bowled out for 124 in 35.2 overs at the Dubai International Cricket Stadium. Captain Mashrafe Mortaza, Mustafizur Rahman and Mehidy Hasan picked up two wickets each while Shakib Al Hasan, Rubel Hossain and Mosaddek Hossain chipped in with a wicket each. That Sri Lanka will fold for a low total seemed a distant possibility when Upul Tharanga got them off to a bright start, hitting 22 off the first 11 deliveries of the chase. Mustafizur then had Kusal Mendis out lbw for a golden duck following which Sri Lanka lost their way. Tharanga hit one more four before dragging one back onto the stumps to be out on 27. From thereon, it was a procession. 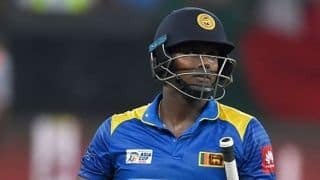 They lost half their side for 60 and when captain Angelo Mathews was removed for 16, they lost their last flickering hope of a comeback. They were in danger of being bowled out under 100. However, Dilruwan Perera, who top-scored for them with 29, and Suranga Lakmal (20) spared them the blushes. The inspiration, though, came through Mushfiqur Rahim who struck a magnificent century and some courageous display from Tamim Iqbal, who batted with a fractured wrist. Bangladesh recovered from two mini-collapses and post ed what turned out to be a winning total. Rahim’s memorable knock of 144 proved critical after comeback man Lasith Malinga was dismissed Liton Das (0) and Shakib Al Hasan (0) off consecutive deliveries in the very first over of the match. Bad turned to worse as Tamim copped a blow to his left wrist while pulling one from Suranga Lakmal. He retired hurt, leaving Bangladesh, effectively, 3/3 in two overs.